Me in the clean water of the pool. I love floating in an innertube before I bite a hole in it. 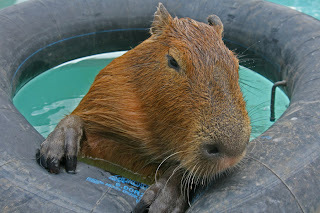 If you know me or any of my kind, then you’ll know capybaras love the water. What you might not know is that we like our water thick, the thicker the better. 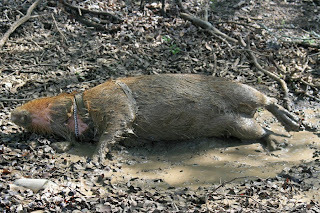 Sure, I’ll swim in clean water when I have to, but mud is what I really want. Lately it’s been hard to come by. I remember way back when I was a baby that there used to be mud everywhere. Water actually fell from the sky. It formed little pools called puddles on the ground. I made my own mud by just rolling in those puddles and using my body to mix the water with the dirt. But then the sky dried up and so did the puddles. The last ones to go were at the bottom of the little creek that runs across our property. One day I ran out there with my owner in tow, all excited about playing in the mud and it was gone! That was the last I saw of it except a few feeble puddles my owner made for me last summer. But something good happened last week. It got really cold and windy and water fell from the sky again! I didn’t know what to think. It had been so long that when my owner let me out to graze, I just stood there in shock. It wasn’t until the next day that I realized what had happened. Sadly, the “rain” quickly dried up and I only got to play in the mud a little before it was gone. In fact, I only tracked it into the house one time. What a waste. I’m going to work on that. Getting ready to make me some MUD! Then last weekend my owner and Sheldon and Coral and Carl all took me out to the creek. You can imagine my surprise when I saw puddles at the bottom! I had actually forgotten all about how the creek bed stores water like a swimming pool. 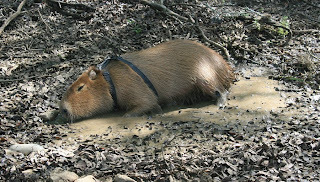 In this case a swimming pool with a leaky bottom made out of mud, otherwise known as capybara heaven. Let me tell you, I made some fantastic mud. I smeared it all over my body. I dug my toes into it. I rubbed it on my face. It felt great. What a delightful future I envisioned for myself with those puddles. I have found the thing I am best at. When my owner took me back the next day, I was stunned. The puddle had lost over half its volume. Nooooo! I tried not to think about it as I played but it was hard. The next day the puddle was gone. The life of a capybara is so hard. 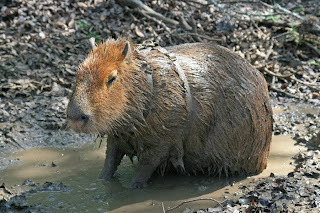 Capybaras are semi-aquatic because mud is semi-aquatic. And then it rained again! Now that took me by surprise. Does this rain thing happen very often? Why don’t I remember it from last year? Is it going to happen again soon? My puddles are back but they’re pretty small. I’d feel better if I knew the would be replenished. My owner watches this thing called “The Weather” on TV. I think I might start watching it too. Shaking off a bit of excess water. Hi Caplin! I cannot wait to see you on Animal Planet. I am wishing you a mud-filled weekend. What is this rain of which you speak? Very cute posting. I watched the Animal Planet episode on April 11. I had not heard of capybaras before that night. I happened upon your page after researching them online. 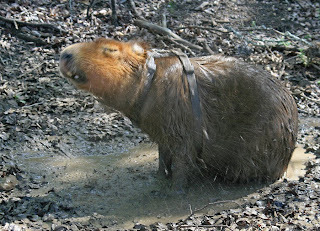 Because of Caplin I am now considering a Capybara myself, but only after much more research.